Developed in 2010, Russian volume eyelashes are applied using a special technique that began in Russia. These lashes improve texture and volume by filling between sparse natural eyelashes. Our fully customized lash salon service allows you to choose the color, curl and volume of eyelash extension to fit your style, eye and face shape, color, contour and size. Twice voted Best Salon in Bevery Hills, we provide the highest quality eyelash extensions and services. We will be on vacation from October 31st until November 8. Please text us at 310-880-8932 if you have any questions. Thank you. Our most popular service, a full set of Russian Volume eyelash extensions offer approx. 80-100% of natural lash coverage. We use flat lashes for our full eyelash extensions classic set. They are much lighter and softer, with better bond and retention. Whether your eyelash extensions were originally applied by us or another lash salon, we offer lash extension touch ups. Beautyful Lashes takes pride in providing the best eyelash extensions in LA. We use top quality lash extensions imported from all over the world. 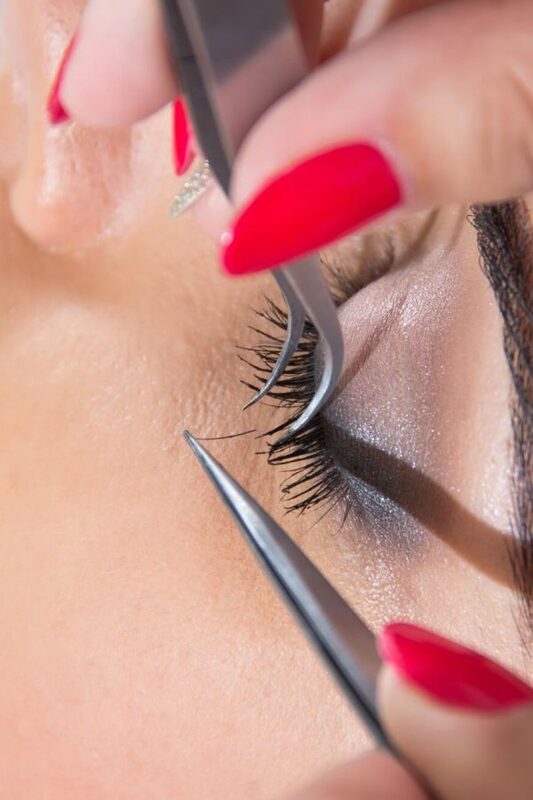 Our professionally trained lash artists take continuing education classes in the most advanced and modern lash techniques. We stay on the cutting edge of luxury eyelashes and that is why Best of Beverly Hills awarded us best salon honors two consecutive years. I've never had lashes but always wanted them. I'm so happy with the results. Mydygma is so sweet and made me feel at ease and relax. She has a light hands and I didn't feel a thing, I fell asleep while she did them. I'll definitely recommend her to all my friends. Update: So I went to another place to get refills to address a bizarre bald spot when Mydygma was not available and because that place is much closer to me, I figured, why not, and opted to go back to that place instead of going back to Mydygma. Big mistake. As I sit writing this updated review, my still sore and slightly raw eyes are naked of lash extensions after Mydygma removed all of them from my swollen, red eyes last night. Anyone who's dealt with an application irritation knows just how painful it can be. This is karma's way of getting me for being lazy about driving from the Valley to the westside over going to someone who is tried and true. Another sign that Mydygma's the best! She was not at all upset that I was going to her to remove the work of another lash place. No tsk tsk on her end, just empathy that I was going through this horrible experience. I'm really keeping my fingers crossed that I can get lashes again soon and this time around, I'm not going to make the mistake of going elsewhere again. I'm very picky with my lashes and I know what's good and how they should wear and feel. I've been going to Mydygma for over 2 years and still am amazed to how beautiful and perfect her work turns out. Not only that, her work space is very clean. And she's just a kind hearted woman. I always leave her office uplifted. I have been doing lashes for 4 years. I was looking for someone who can do Russian volume lashes. I am very picky. I tried some girls before Mydygma and I should say that I am very happy that I met her. She is very professional, she does exactly what I like. And what is important for me also - the procedure is much faster than other girls do. Best quality of lashes, best work, best customer service. Ok ladies! You need to stop looking for the best lash extensions place now because Beautyful Lashes is all you need and more! Why? Well, for once its extremely fast! Yes, you heard me right. Second, the quality of lashes is amazing! They stay on for a very long time and look brand new even a few weeks after application! Now to the best part of my experience, the master herself, Mydygma! She is a God send;. swear she takes the whole experience of getting eye lash extensions on another level. She makes it very personal yet professional. My past experiences were just bad compare to this one! I will always come back for more! I keep getting compliments on how good and natural my lashes look! I'm a forever fan of Beautifyl Lashes! If you haven't already, do yourself a favor and make an appointment now! Thank me later! Looooooving my eyelashes! So professional! Mydygma is so hospitable, friendly and warm. Coming back for my refill, of course. Her prices are fair and she does the most amazing job. Beautyful Lashes is a luxury lash and brow salon located in the heart of Beverly Hills, California. We invite you to our meditative, restful studio where you can replenish your energy and pamper yourself. Our customer's needs are of the utmost importance and our experienced artists will apply your perfect eyelash or eyebrow look. The highest quality and best eyelash extensions in Los Angeles.